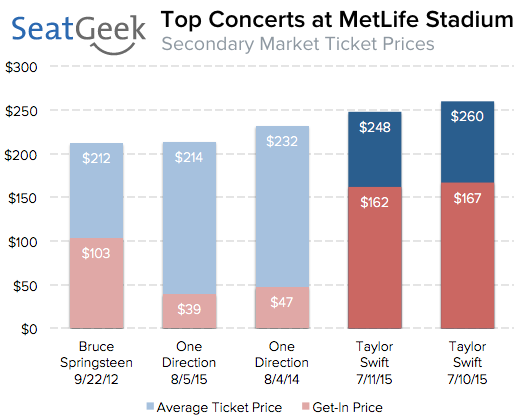 With an average resale price of $260 for Friday’s show, and an average resale price of $248 for Saturday’s show, both T-Swift performances this weekend will be the most expensive concerts in MetLife Stadium history. With an estimated $2.8 million spent on the secondary market for Friday’s show, and another $3.2 million for Saturday’s show, these two Taylor Swift performances are currently the highest grossing shows of her tour. Depending on where a fan wants to sit, prices can vary widely throughout the stadium. The best seats in the house are those in the pit, directly below the stage. The average price of a pit seat is $711, more than a Jets upper level end zone season ticket costs. Floor seats are the next most expensive section, with an average price of $342. The cheapest seats are those in the upper level, which are selling for a relatively reasonable $150 each. Those looking to save money by waiting until the last minute to purchase tickets may be out of luck, as currently the cheapest pair of tickets to Friday’s show cost $258 each, and the cheapest pair to Saturday’s show cost $245 each. With many fans scooping up their tickets months in advance, the supply of tickets still for sale has diminished, driving up the demand, and therefore prices. Taylor Swift is the hottest performer of the year, with an estimated $57 million already spent on the secondary market for her shows in 2015. This is more than the estimated $42 million spent on the secondary market on Giants ($22 million) and Jets ($20 million) tickets last season.